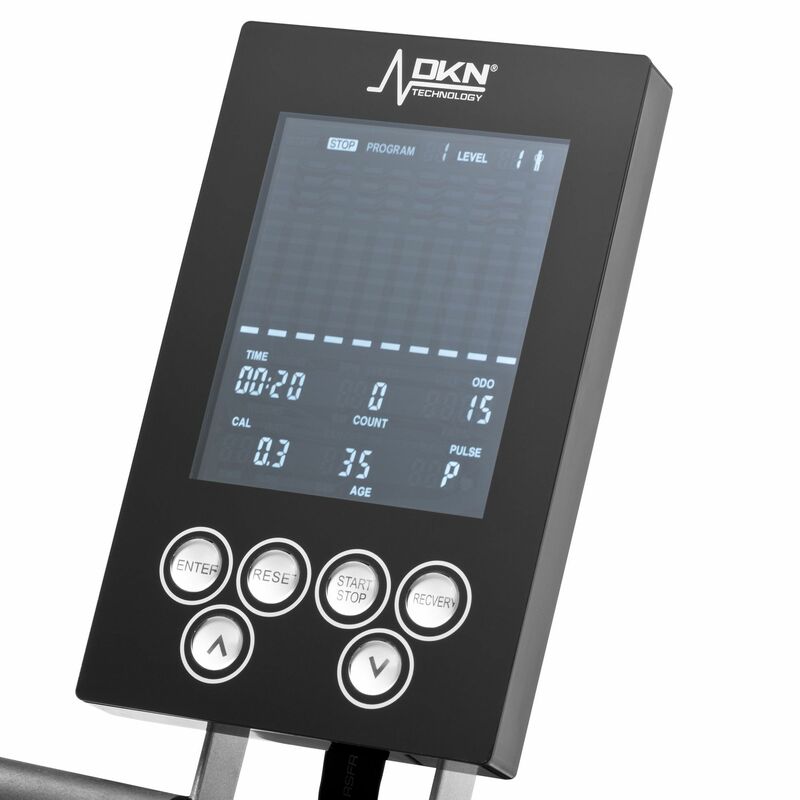 The DKN R-310 rowing machine features a new LCD console display with 6 pre-set runs which are auto-resistance controlled. It also offers the My Zone Programme heart rate control including 4 heart-rate-controlled routines with heart rate measurement taken with the optional chest belt transmitter. The DKN R-310 rowing machine also offers 4 user-defined programmes and a manual run option. Its motivational display keeps the users in tune with their performance by relaying essential feedback directly to the user. This includes time, calories burned, stroke count and heart rate. Additionally, the rower’s comfortable seat and foam hand grip make it a pleasure to use even for prolonged periods of time. The DKN R-310 is a real space-saver and comes with 2 integrated caster wheels for easy moving. The R-310 carries class H certification, as well as CE and EN-957 standards. Great rowing machine, moves about easily on the wheels. I have 2 niggles though. When I am using it I have slipped off the seat a couple of times, it is very slippery, needs to be a bit rougher to avoid this. Also it doesn't keep my settings, overtime I turn it on I have to reset it ? The instruction booklet is written in pigeon english and doesn't help either. I spent quite a bit of time looking for either an exercise bike or rowing machine, looking at all the reviews, prices and features (on a number of sites) before settling on a rower and the DKN R-310 from Sweatband. The feature set for the price is incredibly good value and it's a very sturdy machine, delivery was top notch and assembly took me about 30 mins. My only gripes so far are that the seat doesn't seem contoured enough (at least not for my backside)so i keep sliding of the seat, i solved this with a grip cushion. The other minor gripe is a lack of distance measurement but it's a minor issue that i can work around. A week in and it's been a pleasure to use, recommended. 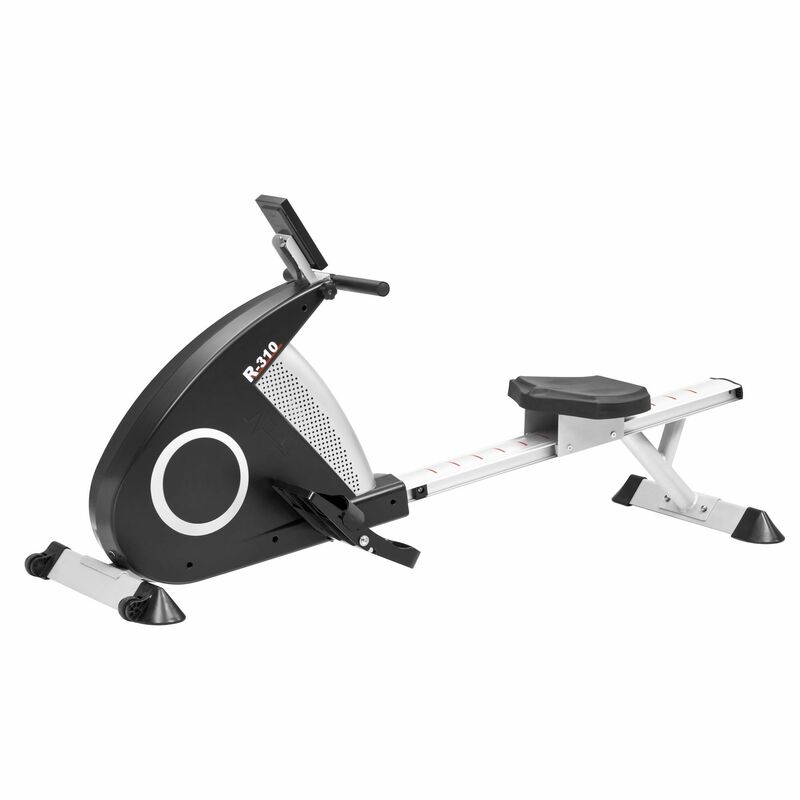 I’ve bought the R-310 rower for my son, who is a big enthusiast of cross fit. He uses this rower as a part of a cross-fit session and is really pleased with it. I also use the R-310 every other day to improve my back stability and this machine works well to me. The resistance range allows for exercising at a wide range of different strength levels and the higher levels provide very challenging rowing sessions. The R-310 builds up quite easily and it is easy to use. The footplates fit nicely and the seat feels comfortable. Good piece of equipment! The R-310 is a good all-round general exercise machine and seems well built. I really like rowing on it, as it works smoothly and quietly. Its digital console is clear and easy to use as well. I’m very impressed by its ramp which, in comparison to virtually flat machines, provides a better workout. Good value for money! I bought the R-310 after a bit of research online. This rower is pretty robust and has a nice, smooth action. It works quietly, so I can easily use it at any time of the day. The resistance is easily adjustable and the higher levels are pretty tough. The console display is clearly laid out and provides good feedback on exercise metrics throughout each workout session. I’m really happy with my choice. 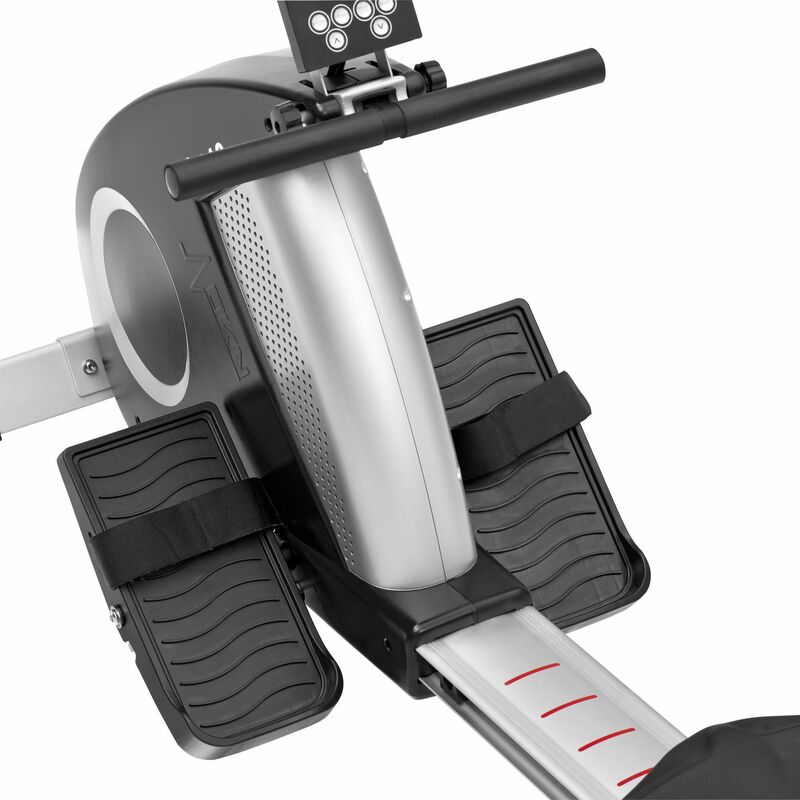 The R-310 rower is quiet and smooth in operation. I am in decent shape and have been getting nice rowing sessions at level 12. This rower has a comfortable seat and feels pretty stable in use. The 310 rower is very straight forward when it comes to assembly. I'm extremely happy with my r-310 and Its resistance range is huge and easy to adjust on the console. Easy to build up - instructions show clearly what to do. I row 5-6 times a week using different programmes and I'm fully satisfied each time I finish my workout. Great piece of fitness equipment. I chose R-310 due to its maximum user weight capacity and the impressive resistance range that it offers. It took me about 45 minutes to put its parts together and once completed, I've been enjoying really challenging workout sessions. Very comfortable and easy to use rower. Also its installation is quick and straight forward. So far no technical issues and I'm pretty satisfied with my results. Good value for money. 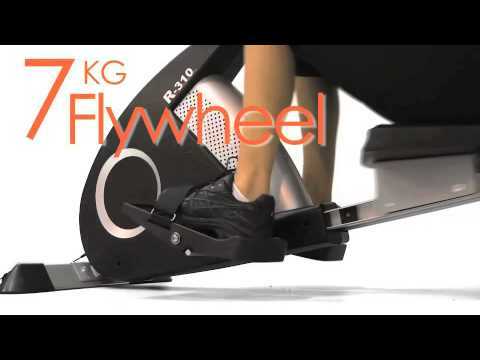 I’ve bought this DKN rower to get fitter and lose some weight. The installation was straightforward and didn't take much time and so far, the R-310 has been used every day and it works well. The ramp seems very robust and the seat glides smoothly over it and provides good rowing position. The R-310 was a good buy and I’m pleased with it. The R310 offers a sturdy base and nice and smooth rowing action. Although it's not the heaviest machine, it is quite stable and is comfortable to row on. I really enjoy doing my interval training sessions on this machine, as its resistance allows for a good variation. The R-310 is not as good as commercial rowers, but it cost a fraction of the price! 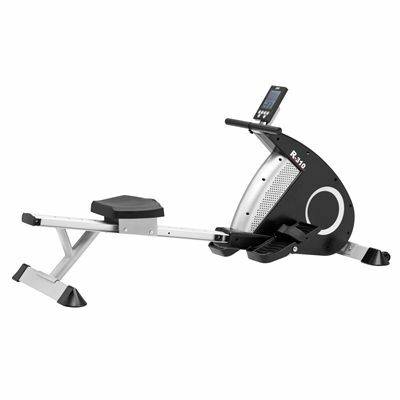 Bought the R-310 rower, as its 28 levels of resistance is impressive in compare to other rowers in its price range. I really like its inclined ramp and heavy flywheel. Already purchased a heart rate transmitter and I can control my HR results during workouts. The R-310 is definitely worth the money and I would recommend it to anyone who needs a good quality home rower. for submitting product review about DKN R-310 Rowing Machine.